Soot and other chemicals produced by fire are toxic, corrosive and can even be deadly. A black powdery substance that is formed when something is burned. It consists mostly of carbon but can contain other toxic and carcinogenic substances including sulfur and formaldehyde. Is it safe to clean soot yourself? No. Standard dust masks and household cleaners are not enough to protect you from inhalation or neutralize the threat. Soot particles are small — between 0.1 and 4 microns (a unit invisible to the naked eye). The particles are small enough to pass through a dust mask and find their way into your lungs where they can cause serious harm. When soot settles, it forms layers on surfaces in the home. When cleaned by traditional methods, such as wiping down with a cloth, some soot particles get redistributed into the air. Once airborne, they spread to other surfaces, as well as contaminate the air. The best strategy to deal with smoke damage and soot is to hire professionals who are trained to deal with such situations and have the proper protective equipment. Some of these conditions can be contracted with even short-term exposure, so addressing a smoke or soot issue in the home immediately is key. Purity Cleaning and Restoration Services, Inc. offers fire and smoke damage restoration services. Our procedure includes the cleaning of contents in the home from furniture to personal belongings that have been exposed, as well as structural cleaning of surfaces in the home such as walls, ceilings, floors, and carpets. Finally, smoke odors and harmful substances are neutralized and removed through dusting with lambswool dusters, HEPA vacuuming, then washing with solutions specially formulated to eliminate soot and other smoke residues. 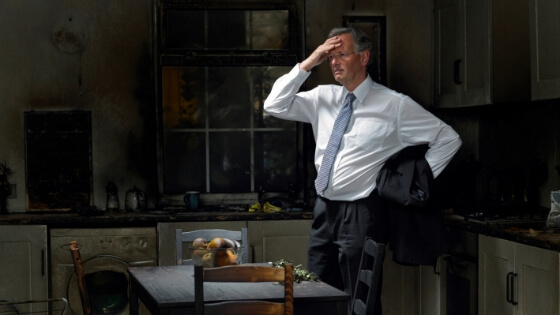 If you have concerns about smoke damage in your home please call Purity Cleaning and Restoration at (406) 642-3545.